I was seeking a new dermatologist as I moved recently. I have always been very proactive with annual skin screenings. Itis really important to me to have a thorough exam. She barely looked at me (no checking of scalp, neck, feet, etc.). She did prescribe me some cortisone cream for a chronic dermatitis issue that I knew about and it has helped. I won't be going back to this doctor. I was seeking a new dermatologist as I moved recently. I have always been very proactive with annual skin screenings. It is really important to me to have a thorough exam.She barely looked at me (no checking of scalp, neck, feet, etc.). She did prescribe me some cortisone cream for a chronic dermatitis issue that I knew about and it has helped. I won't be going back to this doctor. Paola Bonaccorsi is a native Italian and went to medical school at the University of Rome in Italy where she also completed a first dermatology residency. She came to Emory in 1996 to do research on melanoma immunotherapy and ultimately completed her PhD in Tumor Immunology at the University of Rome. Dr. Bonaccorsi enjoyed research greatly, but her passion is taking care of patients with a wide variety of challenging dermatologic conditions. She therefore completed a second internship and a dermatology residency at Emory University in Atlanta, Georgia, where she trained with experts in the fields of dermatology including immunobullous diseases, skin lymphomas, and skin cancers. Most recently, Dr. Bonaccorsi has worked in the Department of Dermatology at Emory University where she took care of patients with challenging skin diseases as well as teaching residents and medical students. Dr. Bonaccorsi is the author of many peer reviewed articles and has lectured to medical students, residents, and at national meetings on both general dermatology and tumor immunology. Dr. Bonaccorsi is Board Certified by both the American Board of Dermatology and the Italian Board of Dermatology. She is a member of several professional associations including the AAD, AMDS, AADDSM and the GSDDS. 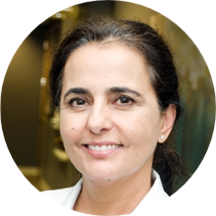 Dr. Bonaccorsi is passionate about her profession and enjoys both medical and procedural dermatology. She strives every day to provide the best dermatology care in a compassionate, professional, and personal manner. Dr. Bonaccorsi enjoys traveling, cooking, and reading, but most of all spending time with her family. She volunteers at her daughter’s school and her church, and supports several local charities. Very knowledge. Dr. Bonaccorsi takes time to answer any questions the patient may have. Loved Dr. Bonaccorsi and staff! This was my 1st visit to May River Dermatology. I found Dr. Bonaccorsi and staff to be attentive, friendly and caring. I appreciated the fact that Dr. Bonaccorsi truly listened to the lengthy history of my specific problem and made noteof my interactions with previous dermatologists. Dr. Bonaccorsi’s professional diagnosis differed from my thoughts on the ongoing (for 6-years) skin problem, yet she performed tests in order to assuage my concerns. They informed me that they were running a little behind, so the wait was a bit longer than expected, but it was well worth it. They were so knowledgeable, friendly and compassionate, and made sure I was well-informed of all myoptions. I have been struggling with cystic acne for almost a decade, but now see a light at the end of the tunnel thanks to Dr. Bonaccorsi & her staff. I am extremely grateful to have found them and am very much looking forward to beginning my treatment plan and many visits to come. Long wait to be put into a room, but once I was in a room, the doctor came in pretty quickly. She was professional and has cute glasses. The office itself was clean and nicely decorated.